After returning from our exciting trip to England, I have to admit this Summer has dragged somewhat. To break up the monotony of my little boy’s three-month school holidays, I used ice cream. Do you think I’m a bad mother? We’ve been to the beach and got sunburn, we’ve collected every size and shape of pebble ever washed up by a high tide, we’ve glued shells on boxes, we’ve made origami peacocks and constructed a solar system on the kitchen table using toast and mugs and the salt cellar, we’ve vegetated in front of the TV (Aaaaghghhh! Yes!!!) and now, dammit, we’re going out for some ice cream. Again. Sometimes when we are out and about, we bump into the postman, and he pulls up on his bicycle and hands me a letter or two. Sometimes he delivers us a package containing toys sent from my family in England. My son is convinced they are gifts from the postman, and so he tends to greet the fellow with more enthusiasm than he usually demonstrates to his own father. He is amazingly energetic for a man close to retirement age. One day I spotted him walking along the sea front, eating an ice cream with another, older man, whom he introduced as the previous postman. The Ex-postman had lived in America for eight years. “Oh, fine, thank you,” I said, trying not to laugh. He was very proud of his knowledge of English. I could tell it added to his status in the village. “Y’all ‘avin’ yourself ha mighty nice day now,” he said, tipping his peaked cap as he walked on, and carefully poking his little scoop back into his ice cream. A couple of weeks later I spotted this ex postman with another man, even older than himself. This old fellow was wrinklier than a raisin, but he still walked at a lively pace. “Howdy folks!” I called out. I am not certain why I said this, but it seemed the appropriate thing to say, at the time. He then introduced me to his companion, who was his predecessor, the ex-ex postman. This charming fellow said he was ninety-seven years old and was the oldest person in the village. “So your predecessor isn’t still around, then?” I asked the ex-ex-postman in Italian. “No, there wasn’t a post office in the village before me,” he answered. Just then the village idiot pedalled past at a leisurely pace on his bicycle. “Hello Giuseppe” they both called out, and looked relieved when he cycled past ignoring them. The village idiot always rides his bicycle around, in no particular direction, and people fly out of his way, dropping babies, or bags of vegetables, or whatever they are holding, with reckless abandon in their haste to clear a path for him. This is because he has customised his bicycle in such a way that he cannot see where he is going. He has painted it fuchsia pink and twined ribbons gaily around the entire frame, he has embellished the wheels with fluttering ribbons and, most importantly, he has somehow attached a music stand to the handlebars, rising up well above his line of vision and displaying photographs of all his favourite football players, taped on firmly. He occasionally hits unmovable objects such as parked cars, and simply gets back on his bicycle, apparently unperturbed, and continues on his way. On this particular occasion he scored a direct hit against a lamppost and he and his bicycle flew off in opposite directions. As he picked up his bike he apologised to the lamppost, realigned his music stand and continued on his way. After watching him roll off down the road, the ex-postman and the ex-ex-postman said they were on their way to the ice-cream parlour, and invited me to join them. My friend Giuseppe was there, keenly awaiting company, as the ice-cream vending business was always slack at this time of day and things could get lonely. Giuseppe of the ice cream parlour is not to be confused with Giuseppe the Village Idiot, Giuseppe thge butcher, or any of the other Giuseppes in the village. It’s quite handy that three-quarters of the males in the village are called Giuseppe, as it is easier to remember everyone’s name. I ordered a coffee granita and an ice-cream sandwich. A granita is basically a slush puppie and, if it is a coffee one, that means a cold double espresso has been tipped in with the ice. It was delicious, but I had failed to take into consideration that I am unaccustomed to such quantities of caffeine, and consequently developed a severe, Parkinsons-type hand tremor which made eating my ice-cream sandwich a hazardous challenge to my grossly impaired eye-hand coordination. 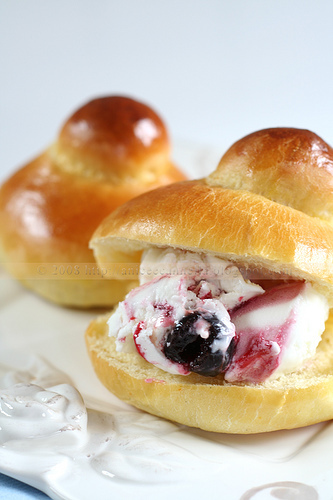 An ice cream brioche… they could have filled it a bit more! The ice-cream sandwich is a Sicilian speciality which consists of the largest possible quantity of ice-cream wedged firmly into a hamburger-style bread roll. The bread is soft and slightly sweet with a hint of vanilla. The whole thing is ambrosial, provided you are capable of eating it without shaking uncontrollably and thus launching the ice cream component of it down your own cleavage at high velocity, then quickly grabbing it back and ramming the entire thing into your mouth in one go, hoping the ex-postman and the ex-ex-postman have not noticed what you are doing and, as a consequence, developing the worst ice-cream brain-freeze you have ever suffered in your life, so severe that your ears almost fall off and you cannot speak because your tongue is cryogenically frozen onto your soft palate. Unfortunately Giuseppe of the ice-cream parlour did notice what I was doing. Now who was the idiot of the village? I think Giuseppe enjoyed the part where I furtively fondled my own breasts, because since then he has been offering me free ice-cream every time I go in there. I have not concerned myself too much with his motives. Acts of generosity should always be accepted graciously, shouldn’t they? I can certainly be gracious. I have became a regular, almost daily, customer of his, actually. On balance, it hasn’t been such a bad Summer after all. And my son thinks I am a wonderful mother. Questionnaire: How Sicilian are you? Manna from Heaven? Or from Sicily? Too funny..! And honest parenting, refreshing and an enjoyable read! haha this is brilliant! you are such a funny writer…and im glad that didnt happen to me! !